One of the most frequently performed surgical procedures in orthopaedy and traumatology are total arthroplasty of the hip and the knee. Patients who are undergoing those treatment are exposed to thromboembolic complications. It is necessary to prevent them against thromboembolic complications. Current standard practice for anticoagulant prophylaxis to prevent venous thromboembolism after total hip or knee arthroplasty includes subcutaneous low-molecular weight heparin. Dabigatran etexilate is an oral, reversible direct thrombin inhibitor, with predictable and reproducible pharmacodynamic effects and pharmacokinetic characteristics that permit once-daily dosing. The aim of this study was to evaluate the incidence of venous thromboembolism (measured using Doppler ultrasonography), pulmonary embolism and mortality after using both types of prophylaxis. Also evaluated the safety of medicines, examining the post-operative blood loss, decreased hematocrit and hemoglobin. We analyzed the incidence of complications by assessing the state of local inflammation, the level of C-reactive protein. There was no significant difference in the safety of the oral and subcutaneous thromboprophylaxis in patients undergoing either total hip or knee replacement. Blood loss after surgery, duration of surgery, decrease of hematocrit and hemoglobin were not significantly different. None of the both drugs did not differ significantly in the incidence of inflammatory complications a systemic and a local. In the studied population, the effectiveness of thromboprophylaxis was high. 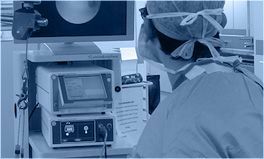 One of the most frequently performed surgical procedures in orthopaedy and traumatology are total arthroplasty of the hip and the knee. Patients who are undergoing those treatment are exposed to thromboembolic complications. It is necessary to prevent them against thromboembolic complications. Current standard practice for anticoagulant prophylaxis to prevent venous thromboembolism after total hip or knee arthroplasty includes subcutaneous low-molecular weight heparin  This standard requires from patients a self-discipline and is associated with the necessity of education how they perform. Consequences of this prophylaxis are often a patients concerns before injections, as well as bruises in the performed place. Dabigatran etexilate (hereafter termed dabigatran) is an oral, reversible direct thrombin inhibitor (DTI), with predictable and reproducible pharmacodynamic effects and pharmacokinetic characteristics that permit once-daily dosing . Beside their proven efficacy and safety [3–8], the new Direct Oral AntiCoagulants are likely to take more than half of the anticoagulant market share between now and 2014 . Three major prospective, randomized, double-blind non-inferiority trials have compared the efficacy and safety of dabigatran (150 mg or 220 mg once-daily) starting postoperatively, with subcutaneous enoxaparin, in patients undergoing hip (RE-NOVATE)  or knee arthroplasty (RE-MOBILIZE  and RE-MODEL ). 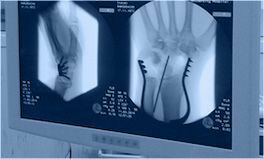 In these studies, dabigatran and enoxaparin at the recommended dose once a day reduced the overall risk of venous thromboembolism and mortality after hip  or knee arthroplasty [11,12] with a similar safety profile. The aim of this study was to evaluate the incidence of venous thromboembolism (measured using Doppler ultrasonography), pulmonary embolism and mortality after using both types of prophylaxis. Also evaluated the safety of medicines, examining the post-operative blood loss, decreased hematocrit and hemoglobin. We analyzed the incidence of complications by assessing the state of local inflammation, the level of C-reactive protein (CRP). 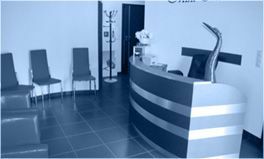 In the study we included 106 randomly selected patients who were operated during the period 2 years (from 01.01.2010 to 12.31.2011) in the same place Department of Orthopedics and Traumatology – Hospital in Kościerzyna. There were done 64 elective hip arthroplasty and 42 elective knee arthroplasty. Patients were randomly divided into two groups. 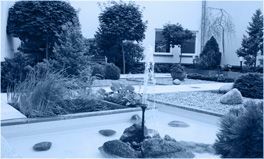 In the first group (G1) were 53 persons who received oral prophylaxis using dabigatran (dabigatran etexilat; Pradaxa Boehringer Ingelheim). In this group dabigatran was administered at the operative day in dose 110 mg (1 tablet) not fewer than 4 hours after the operation, and the following days the dose was 220 mg (2 tablets) once a day at 8 am. In the second group (G2) were 53 patients who where treated with low molecular weight heparins as a subcutaneous injection: random enoxaparin (enoksaparinum natricum, Clexane Sanofi Aventis)a, nadroparine (nadroparinum calcicum; Fraxiparine GlaxoSmithKline)b or dalteparin (dalteparinum natricum; Pfizer’s Fragmin)c In this group, heparin was administered at the day before surgery at doses respectively: 40 mg/0.4 mLa 3800 j.m./0.4 mLb, 5000 j.m./0.2 mLc at 8 pm, and the following days in a similar dose once a day at 8 pm. In all patients after operation at the day of surgery, was used autotransfusion of collected blood. The day after surgery the blood loss was measured in the drain redone. Drains were removed on the second day after surgery at 10 pm. 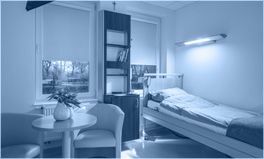 In all patients in the fourth day after surgery were measured the level of C-reactive protein, which was repeated at the day when patient was discharge from the department. The wound stitches were removed in all patients 14 days after surgery. We involved in the study 64 women and 42 men in the age from 33 to 80 years (mean 62 years) (Table 1). 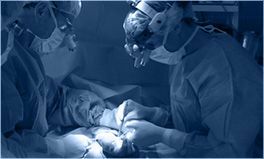 In the group G1 one patient was excluded because of a decision of a multi-stage surgery. Body weight in the study group ranged from 43 to 140 kg (mean 81 kg), growth from 1.45 to 1.90 meters (average 1.66 meters). Average body mass index was 30 kg/m2 (SD=5.6). In the study groups G1 and G2 the age, the height, the weight and body mass index did not differ significantly (Table 1). Total hip replacement was performed in 33 patients with oral prophylaxis (group G1b) and in 31 patients with low molecular weight heparin prophylaxis (group G2b). Total knee arthroplasty was performed in 20 patients with oral prophylaxis (group G1k) and 22 patients with low molecular weight heparin prophylaxis (group G2k). The mean duration of the surgery in a G1b group was one hour and 52 minutes (from 45 to 210 minutes), in G2b agroup one hour and 48 minutes (from 79 to 220 minutes), whereas in the G1k group was longer and was 2 hours and 15 minutes (from 55 to 150 minutes) in G2k group two hours and 14 minutes (from 60 to 200 minutes) (Table 2). 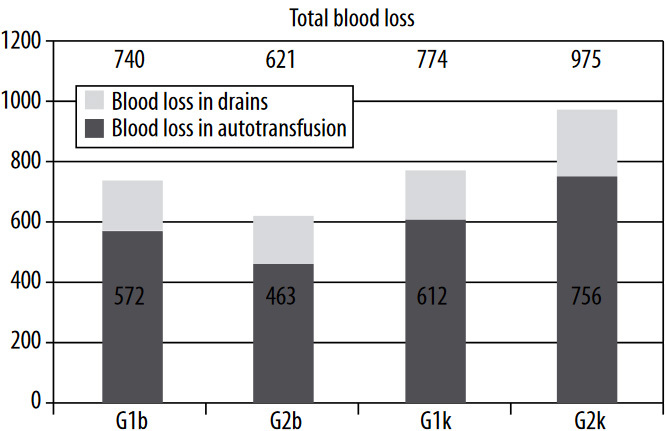 The measurements showed that in the G1b group average blood loss was 740 ml (from 210 to 1520 ml), in the G2b group 621 ml (from 125 to 1330 ml), in the G1k group 774 ml (from 120 to 1425 ml), and in the G2k group 975 ml (from 500 to 1630 ml) (Figure 1). These values were not significantly different. An average decrease a level of hematocrit was in the group G1b 12.37%, in G2b group 12.45%, while in G1k group 8.93%, and in G2k group 8.33%. A relative decrease hematocrit compared to the baseline level in each group were respectively: G1b 27%, G2b 29.42% and G1k 21.39%, G2k 18.81%. Comparing both: the relative and absolute decrease level of hematocrit in groups Gb and Gk there were no evidence that the difference was statistically significant (Table 2). 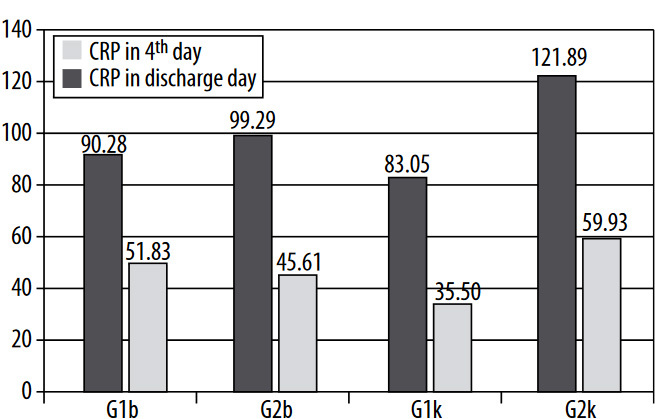 The decreased level of hemoglobin after surgery compared with the value at the day the patient was before operation in the G1b group was 3.94 g/dL in the G2b group 4.22 g/dL in the G1k group 2.98 g/dL and in G2k group 2, 92 g/dL. The relative decrease level of hemoglobin compared to the baseline level was a in each group: G1b 30.09%, G2b 29.92%, G1k 21.89%, 19.96% in G2b group. Table 1. A comparison of the patient groups G1 i G2. Table 2. 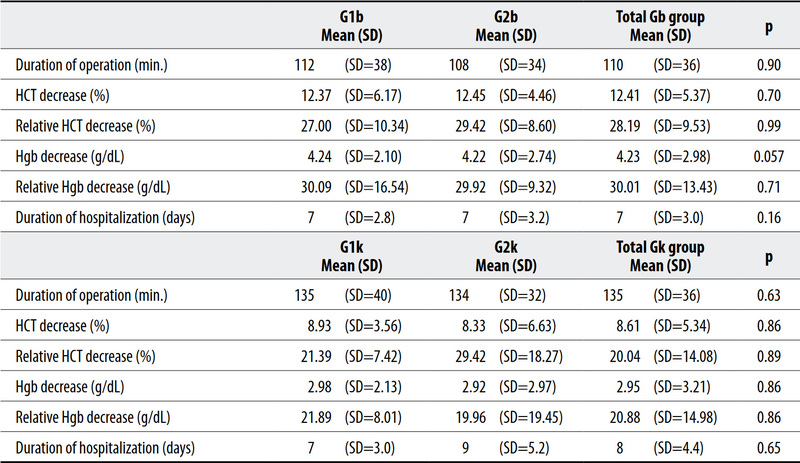 Comparison of the Gb group (hip arthroplasty) and Gk group (knee arthroplasty). Figure 1. Blood loss after surgery [milliliters]. Figure 2. The level of C-reactive protein after surgery [mg/L]. In one patient we observed a wound healing complications (a soft tissue hematoma), however it did not require surgery. 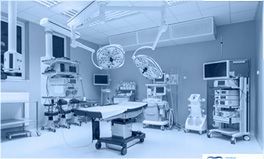 The average value of the C-reactive protein in the fourth postoperative day in G1b group was 90.28 mg /L (SD=53.76); G2b group 99.29 mg/L (SD=47.89) in G1k group 83.05 mg/L (SD=38.87), and in G2k group of 121.89 mg/L (SD=60.75). The average value of C-reactive protein at the day when patient was discharge from the hospital in the G1b group 51.83 mg/L (SD=23.26), G2b 45.61 mg/L (SD=25.69) in G1k group 35.50 mg/L (SD 12.06) and in G2k group 59.93 mg/L (SD=47.93) (Figure 2). The differences in the C-reactive protein values were not statistically significant. In G1 group in 5 patients (9.6%) were suspected the venous thrombosis, based of clinical examination, which was confirmed in 1 patient (1.9%) in the ultrasonography Doppler examination, there were a wall blood clot with preserved the femoral vein flow in the vessel. In G2 group the venous thrombosis was suspected in 2 patients (3.8%), which was confirmed in 1 patient (1.9%) in the distal segment. The difference in the incidence of thrombosis was not statistically significant. Both of those groups came from the same population. There was no significant difference in the safety of the oral and subcutaneous thromboprophylaxis in patients undergoing either total hip or knee replacement. Blood loss after surgery, duration of surgery, decrease of hematocrit and hemoglobin were not significantly different. None of the both drugs did not differ significantly in the incidence of inflammatory complications systemic and local. In both groups, the effectiveness of thromboprophylaxis was high. A deep vein thrombosis confirmed by ultrasound occurred only in two patients. 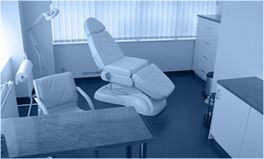 There was no significant difference in the incidence of thromboembolic complications during oral prophylaxis as well as by injection.